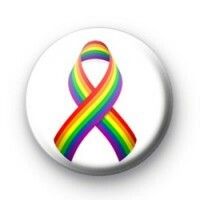 Gay Pride rainbow ribbon badge in white with a rainbow gay pride ribbon design. We have a huge range of gay badges, lesbian badges, LGBT badges and gay pride badges available on the website. We try to cater for all sexualities, but if you notice something is missing please do get in touch & we will list something for you. Be sure to check out the rest of our LGBT and gay badges in our gay badge category. We have hundreds of designs to choose from & we supply a lot of pride events around the world. 25mm badge made in the Kool Badges Workshop.